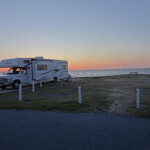 Spring has sprung, and I know many of you in the North are counting down the weekends until you can pull those sleepy campers from their long winter’s rest and hit the road again. 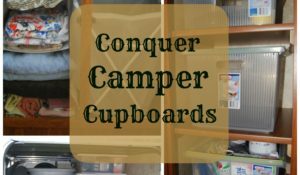 As you get ready for the camping season by organizing the camper and loading things back in, here’s some important information to keep in mind so you don’t inadvertently overload your camper. 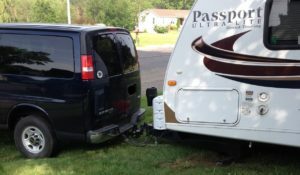 In our earlier Camper in Training post on selecting a camper I talked about the importance of knowing how much your vehicle can tow in order to select the right sized camper. In that post I talked about the fact that many people carry far more in their campers than they think. 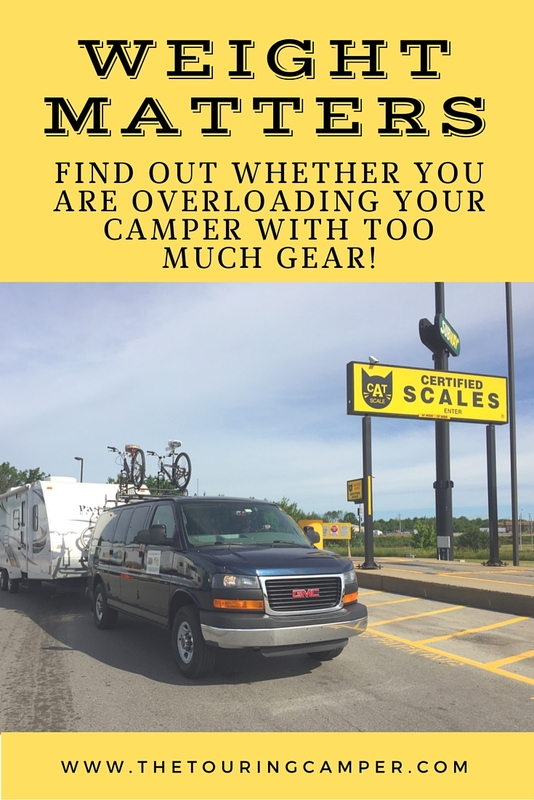 Kristin and I have long wondered just how much gear weight we are loading into our camper, so at the start of our last camping trip we stopped at a CAT Scales to find out whether we have been overloading our camper! It is important to know how much weight you are towing so that you can be confident you are safely rolling down the highway. 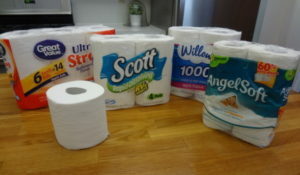 I was pretty confident that we were hauling more weight than what several dealers at RV shows have tried to convince me of, but I did not know the exact amount. We thought this would be a good time to do a weigh-in since we were loaded for a two-week trip with food, clothes, bikes, and other gear. We realized after the fact that there was still a bit of water left in the freshwater tank (probably around eight to 10 gallons) from our last campout; additionally both propane tanks were only about 1/2 full. We first located a CAT Scales that was along our intended route so we didn’t have to do any extra driving. 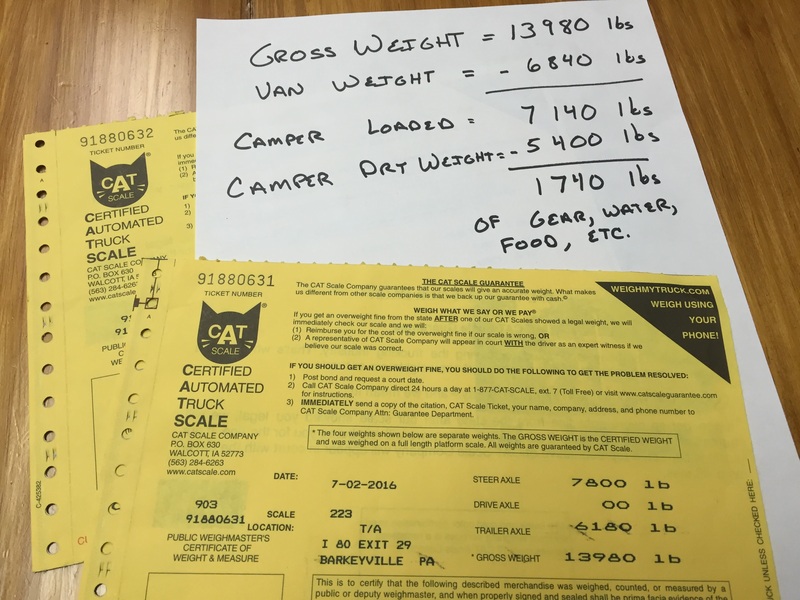 Before I started the weigh-in process, I stopped in the office area to talk to the scale operator and explained that I needed to do a “double weigh”: First weighing the whole rig (van and camper), then weighing just the van. This double weigh cost us a total of $12.50 ($10.50 for the first weigh and $2.00 for the second). 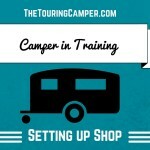 After explaining what I needed to do, we drove the van and camper up on the scale. The first weigh was the Gross Combined Weight. Note: Some scales will allow you to have your tow vehicle on one scale and trailer on another thus doing a single weigh. However, since many people tow with an equalizer hitch you will not get the most accurate picture. Thus, I highly suggest unhooking and then just weighing your tow vehicle. 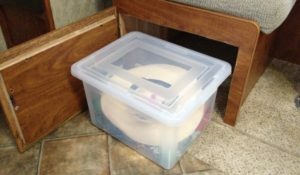 After completing the first weigh, we located a safe place to unhitch the camper. Then we drove our van back onto the scales and let the scale operator know it was our second weigh. This weight was the Gross Tow Vehicle Weight. Note: Make sure that you have the same people, etc., in the vehicle both times or it will throw your numbers off. After that we were ready to hook back up with the camper. While I was doing that I located the yellow VIN number placard on our camper to get our unit’s Unloaded Trailer Weight. Next, I subtracted the Unloaded Trailer Weight (found on the yellow VIN tag on the camper) from the Loaded Camper amount. 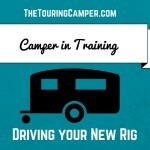 This new number will tell you the weight of the gear that you have in your camper. 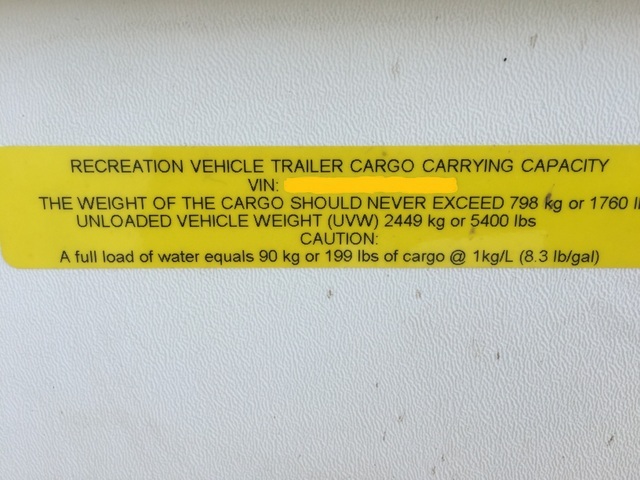 And remember, this number should not be larger than the max cargo capacity of the camper (we were within 20 pounds of our max–yikes!). Anyone else ever had their camper weighed? What did you find out? 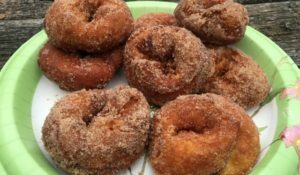 Hi Sara–thanks so much for stopping by! 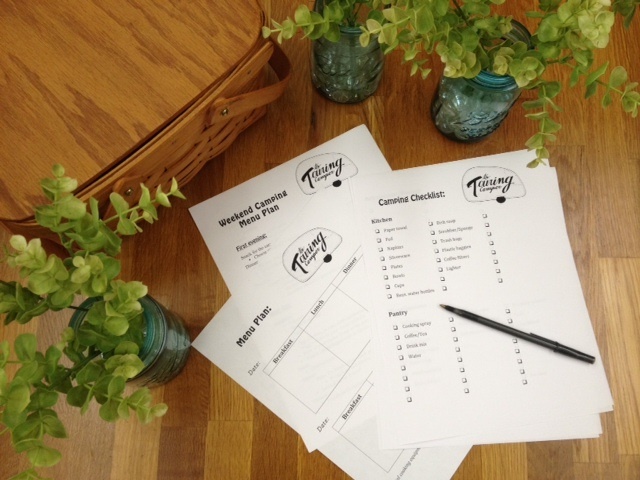 Glad to hear that you are feeling more confident with each passing year–let us know if you get to do a weigh in! 🙂 Happy camping! Thanks for the reminder! Just checked the last time we weighed in was back in April of 2015. Not sure if it’s was fully loaded or not. Also we put Cedar Creek Campground, TN on our bucket list. The park looks fabulous. Quick question: How difficult is it to load/unload the bikes from your roof rack. We are contemplating purchasing a truck cap and roof top rack system. Hi Denny–it was great to hear from you! 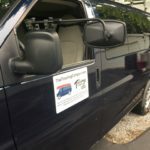 The roof rack that we have is a bit involved because we don’t have official Yakima bars for our van–they are just a knock-off ladder rack. Therefore, the Yakima basket is attached to the ladder rack, with the Yakima bike mounts affixed to the Yakima basket. This adds an extra 4-5 inches of height, i.e., Jarrett has to have a ladder (or he has to climb onto the van) in order to reach them. So it’s not ideal and not a long-term solution–we’ve just been trying to work with what we have at the moment. 🙂 There are some Yakima or Thule products that mount directly to the top of a truck cap, with a quick release function, which would make it a little more manageable. You’d probably still need some kind of step-stool to reach them though. We hope you enjoy Cedar Creek as much as we did–definitely aim for site 50 because it was incredible. 🙂 If you like bird-watching, bring the binoculars, because you’ll have a prime view! Thanks for showing people how to actually use the truck scales. 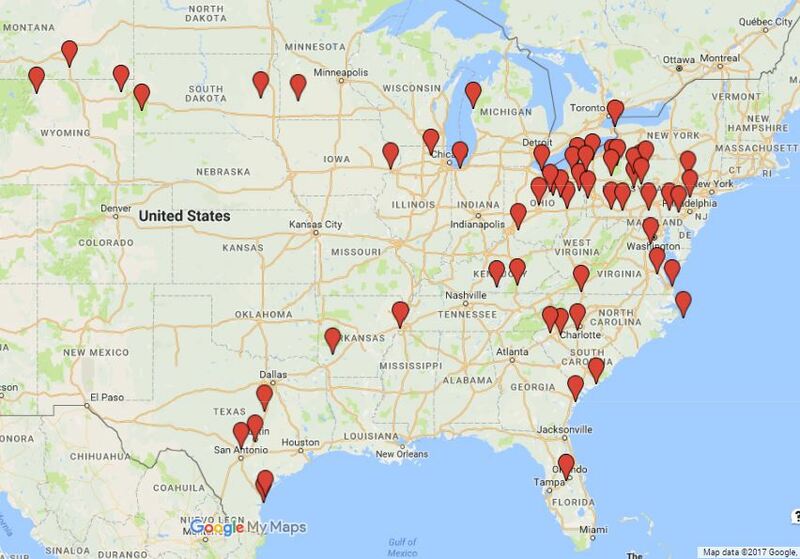 My wife and I drove commercial truck for over 10 years and have scaled many, many times. 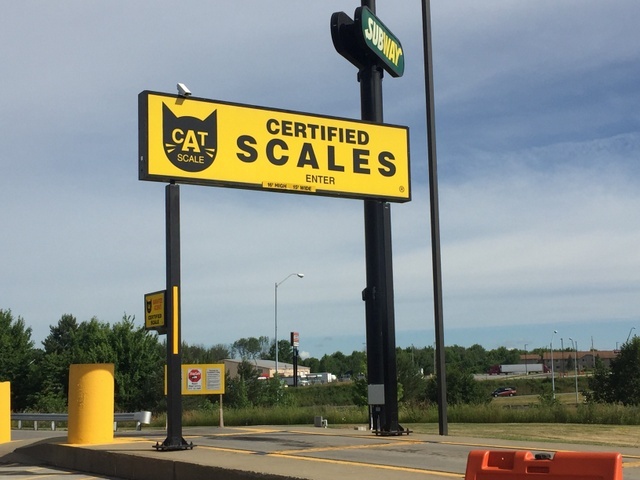 Now that we have our first TT we get to go thru the scale game again, fortunately we have a feed store close to home with a smallish platform scale to use. Not nearly complex as a CAT scale, but it will be a lot easier than trying to do the drop and hook in a truck stop. Hi Dave–thanks so much for stopping by and reading! 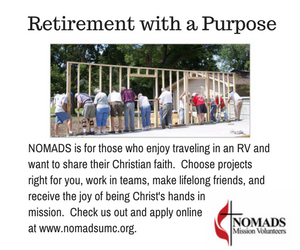 Congrats on the new travel trailer! That sounds like a great idea on weighing it at the feed store. 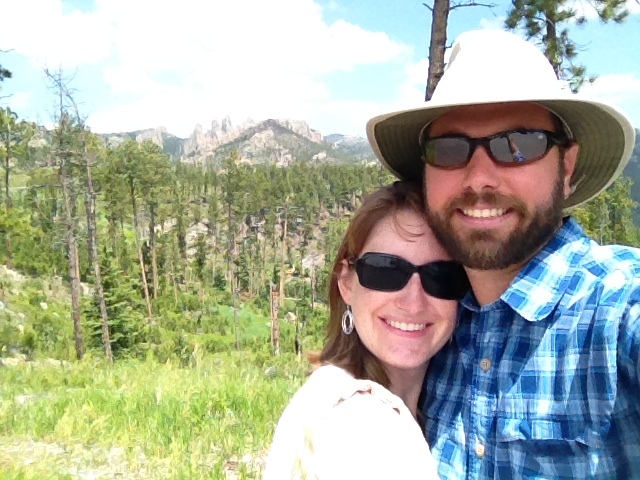 All the best as you embark on your first season of RVing!